The DXi8500 is a high performance deduplication solution with the power and flexibility to anchor an Enterprise-wide backup, disaster recovery and data protection strategy. 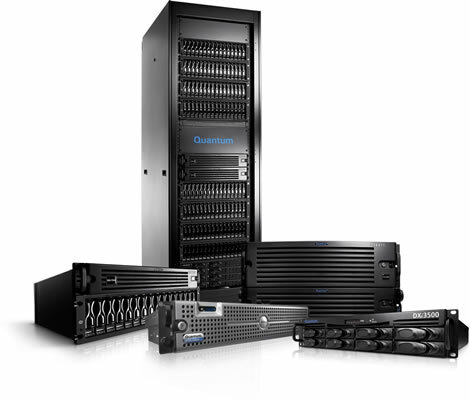 The DXi8500 offers industry-leading performance, up to 6.4TB/hour, and advanced deduplication technology that reduces typical disk and bandwidth requirements by 90% or more. Scaling from 20 to 200TB of usable capacity, the DXi8500 presents the industry’s widest range of presentation options, including deduplication-enabled VTL, CIFS, NFS, and OST, as well as native-mode (non-deduplicating) VTL and NAS shares. All interfaces can be supported simultaneously in the same unit to provide maximum configuration options for heterogeneous environments. The DXi8500 features an integrated path to tape for both VTL and OST presentations, providing a direct link to physical tape libraries for both short-term protection and long-term retention. The DXi8500 provides Enterprise deduplication systems the management tools needed to integrate them into a multi-site, multi-tier protection strategy offering both advanced reporting for internal operations and support for global management across users’ disk, tape, and replication systems.